Valentine’s Day is right around the corner. 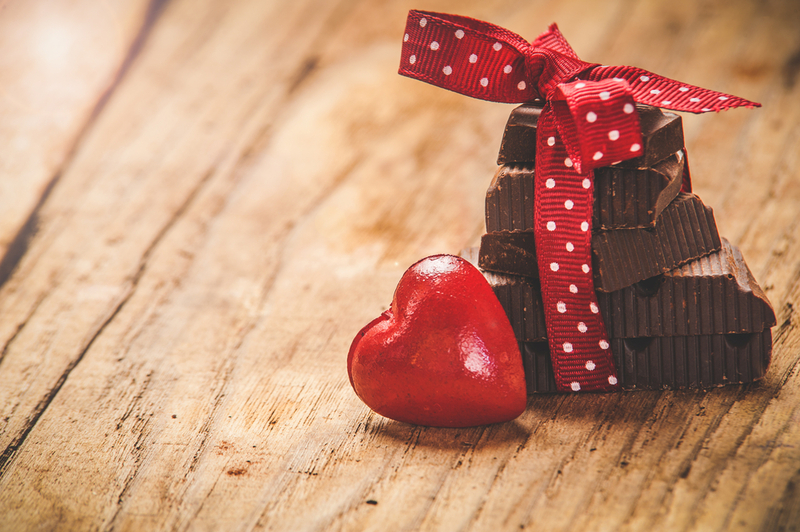 The store shelves are stocked full of heart-shaped boxes filled with delectable assortments of chocolates. Have you ever looked at those boxes and wondered why we buy these sweets for our sweethearts, and how the whole ritual got started? Here’s a little history behind the tradition, along with a few other lovely Valentine’s Day fun facts. The roots of Valentine’s Day go way back, as far back as Roman times actually. However, back then, the holiday named for Saint Valentine was not associated, even remotely, with love. That association came later. And the giving of chocolates is a fairly recent development. It all came to be in the mid-1800s. The Victorian English loved the idea of courtly love. Richard Cadbury, son of John Cadbury (the founder of the famous Cadbury cocoa and chocolate company) had just improved upon his company’s chocolate making technique, creating a better tasting drinking chocolate by extracting pure cocoa butter from whole cocoa beans. As a result, he wound up with an excess of cocoa butter. Instead of letting it go to waste, Cadbury used the cocoa butter to produce eating chocolates. But he didn’t stop there. He went on to design beautifully decorated boxes, adding images of cupid and roses. While he didn’t patent the heart-shaped box, many think that he was the first to start the tradition. And his boxes were marketed as having two functions – holding the chocolates and then being used as a box to store love mementos after the chocolates were gone. The Victorian English loved the idea of love, and one of their favorite ways to express their affection was to shower their sweethearts with elaborate cards. In 1847, a Massachusetts woman by the name of Esther Howland got wind of this tradition and decided to run with it. She started developing her own handwritten Valentine’s Day cards, and quickly turned it into a successful business, spreading Valentine’s Day throughout America. Ever heard of the expression “I wear my heart on my sleeve?” Not quite sure where that came from? It actually got started in the 1700’s and had a much more literal meaning. During this time, if a man was fond of a particular woman, he would write her name on a heart-shaped piece of paper and pin it right onto his sleeve, declaring his affections to the world. Maybe that’s something you could do for your sweetie this Valentine’s Day! The first romantic associations to Valentine’s Day came about in the 1300s, with Geoffrey Chaucer. In his poem, “The Parliament of Fowls,” he put forth the idea that Valentine’s Day is romantic because it is the day that the birds get together to find their mates. This poem led to using bird imagery in love letters during the Medieval time period. It also started the idea that the first bird you saw on Valentine’s Day would indicate the type of man or woman would marry. For instance, if a woman saw a robin, she would marry a seaman, while a goldfinch meant a wealthy man. If she saw a woodpecker, however, it meant she would not get married at all. This idea of bird watching eventually turned into one of our most common Valentine’s Day traditions, going out on a romantic dinner date with your sweetheart. There are all kinds of Valentine’s Day traditions, many of which have been around for centuries. Whether you choose to follow some of these traditions, or start a few of your own, food is always a wonderful way to show someone you care. Say “I love you” this Valentine’s Day over a big stack of pancakes (as well as some of your other breakfast faves) at Kate’s Kitchen in the Northland and Ronnie’s Restaurant in Lenexa!